Walid Elmahdy, Mohamed Osman, Mohamed Farag, Haisam Saad, Marius Berman. Royal Papworth Hospital NHS Foundation Trust, Cambridgeshire, United Kingdom. Background The phenomenon of prosthesis-patient mismatch (PPM) since first described in 1978 has received much attention. Studies have shown conflicting evidence regarding increased short- and long-term morbidity and mortality associated with PPM after aortic valve replacement (AVR), especially with concomitant bypass grafting. Objectives This study sought to evaluate the effects of PPM on postoperative and late all-cause mortality in patients after isolated AVR. Methods A retrospective, single-centre study involving 1707 consecutive patients ≤ 80 years of age with preserved left ventricular function who underwent elective primary isolated AVR operations from 2008 to 2018. Patients were stratified into 2 groups according to the presence of PPM (n=96), defined as effective orifice area index <0.85cm2/m2 body surface area, and no PPM (n=1611). The effect of PPM on mortality was evaluated with univariate and multivariate regression analyses. Results In-hospital mortality was 0.8% (4.2% in PPM group vs. 0.6 in no PPM group; P=0.005). PPM occurred more frequently in female gender and older patients. PPM was highly predictive of mortality (median 4 years [IQR 2-7]; HR: 1.79, 95% CI: 1.27-2.55, P=0.002) [Figure], and remained strongly and independently predictive after adjustment for other risk factors (HR: 1.56, 95% CI: 1.09-2.24, P=0.015). Other independent predictors of mortality included advanced age, presence of diabetes, elevated preoperative serum creatinine level and longer bypass time. 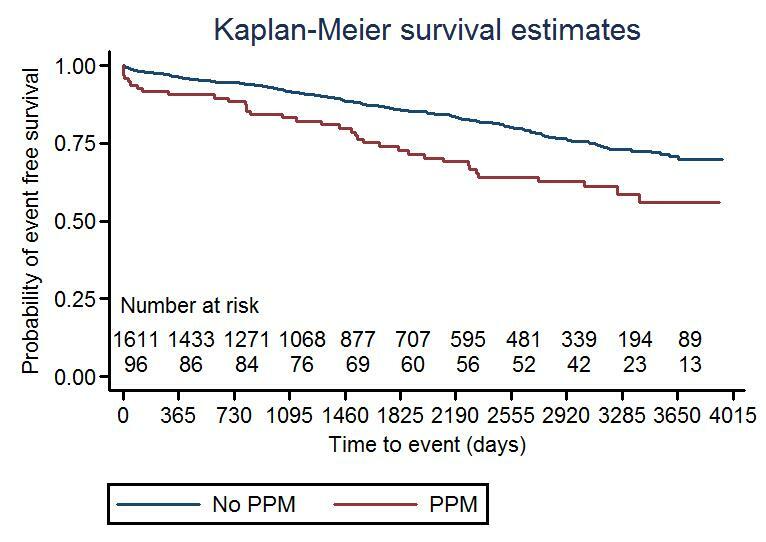 Conclusions PPM increases in-hospital mortality and is an independent predictor of late all-cause mortality after low risk primary isolated AVR operations. Strategies to possibly prevent PPM should be explored and implemented.